Decadent. Tasty. Draped in polka dots. Enough said. Our nutritionist calls it "satiety," but we call it "50 Shreds of Crave." But don't be afraid to be seen with this Coconut Crave in your hand. You'll taste coconut shreds, creamy almond butter, and superfoods like chia seeds, flax, sorghum crisps and dates. 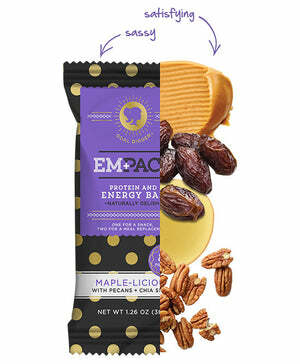 They make this bar loaded with health and energy benefits, but it's also just a darn good go to for your daily snack. Plus it has high-quality whey protein isolate to help promote and maintain lean muscle as well as natural ingredients, which make 1 bar a great snack or 2 bars an awesome meal replacement. The King of all Dates and possibly all superfoods. They boost energy and pacify hunger. High in potassium and fiber and a great source of energy dates are a great way to keep all of our whole food ingredients together. They are also where our natural sweetness comes from. That’s why we say, sweetened mainly by dates! High-Quality whey protein isolate helps rebuild muscle fibers, give you energy, deters cravings, and the American Journal has reported that when combined with an exercise routine or restricted-calorie diet, it promotes weight loss. As the most nutrient dense part of the coconut, coconut oil can actually help your body be more efficient at digesting and absorbing the vitamins responsible for things like glowing skin, strong bones, improved mood, and solid brain function. An ancient grass that improves digestive health, is a good source of antioxidants, helps balance blood sugar, and helps fight inflammation. Sorghum also helps fill you up and can prevent spikes and dips in blood sugar levels that can lead to moodiness, fatigue, cravings, and overeating. Our Sorghum Crisps are non-gmo and gluten free and contain tannins that are widely reported to reduce caloric availability and can help fight obesity, weight gain, and metabolic complications. Sunflower lecithin is naturally occurring in sunflowers and can provide you with an incredibly powerful antioxidant known as posphatidylcholine, which prevents free radicals from destroying cells. It has been called the world’s best brain supplement. It also has a variety of benefits, including promoting brain health and improving cognitive functions such as focus and memory. It can help reduce cholesterol levels and help with arthritis by lubricating joints.